Since September 2015, the California Dungeness Crab Fishing Gear Working Group (Working Group) has been taking steps to actively identify and be responsive to elevated risks of whale entanglements in California Dungeness crab fishing gear. This unique coalition of diverse stakeholders—which includes commercial and recreational fishermen, environmental organization representatives, members of the whale entanglement response network and state and federal agencies—is committed to developing solutions that support thriving whale populations along the West Coast and a thriving and profitable Dungeness crab fishery. For a Fact Sheet about the Working Group and other background information, visit the California Dungeness Crab Fishing Gear Working Group webpage. 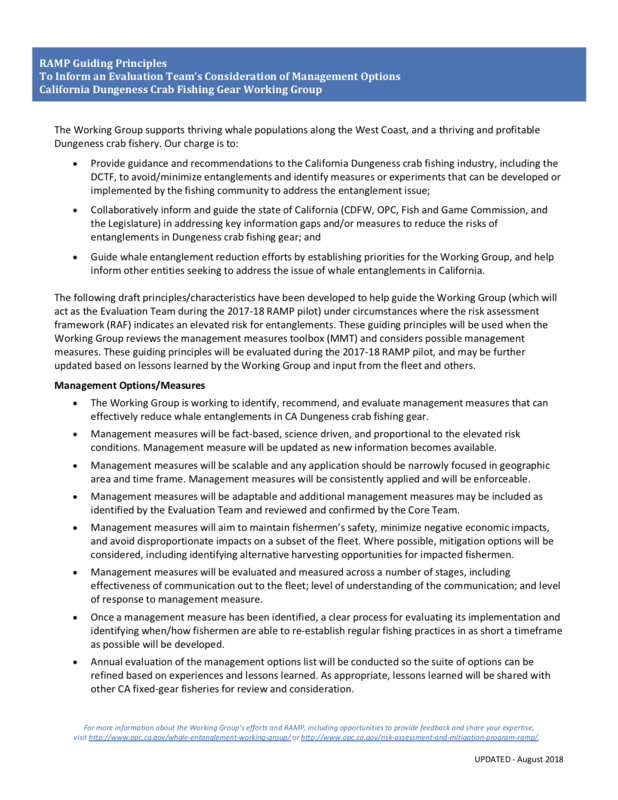 A Risk Assessment and Mitigation Program (RAMP) has been developed by the Working Group to assess circumstances where entanglement risk may be elevated and, as needed, identify a possible management measures for the CDFW’s Director’s consideration (see Senate Bill 1309 here.) The program is designed to be flexible and responsive to considering new information, technologies, and approaches to reducing the risk of entanglements. Building on lessons learned during the 2017-18 RAMP Pilot (here and here), the Working Group has fine-tuned the RAMP for the 2018-19 fishing season. The Working Group is scheduled to convene four times to conduct a pre, mid, late, and postseason risk assessment. A subgroup of Working Group (Evaluation Team) may also be convened by the agencies in response to elevated entanglement risk. All RAMP related discussions, risk evaluations, and possible management recommendations developed by the Evaluation Team will be posted on this webpage and circulated via the Working Group’s email distribution list. If you are interested in receiving these updates via email, please contact info@cawhalegroup.com. The Working Group welcomes your feedback and insights on the RAMP – visit http://www.opc.ca.gov/whale-entanglement-working-group or contact the Working Group at info@cawhalegroup.com. *Outlook considers regional variability and considers spatial differences of where whales may be congregated. More information and rationale for the scoring of each factor is available here (also see “Summary” section below for additional details). The Working Group anticipates changes in the distribution and concentrations of whales in the coming weeks and all risk factors will continue to be monitored closely and responded to as needed. The Working Group encourages recreational Dungeness crab fishermen and other commercial and recreational fishermen engaged in fixed gear fisheries to fish as minimal gear as possible and remove any gear that cannot be serviced within required timeframes. When possible, fishermen should consider reducing the number of traps that are being actively fished to reduce vertical lines in the water and avoid fishing in areas where there are groups of feeding or migrating whales, schools of anchovy, and/or swarms of krill. This update will be shared via the DCTF email list, the Working Group webpage, and CDFW’s crab webpage. 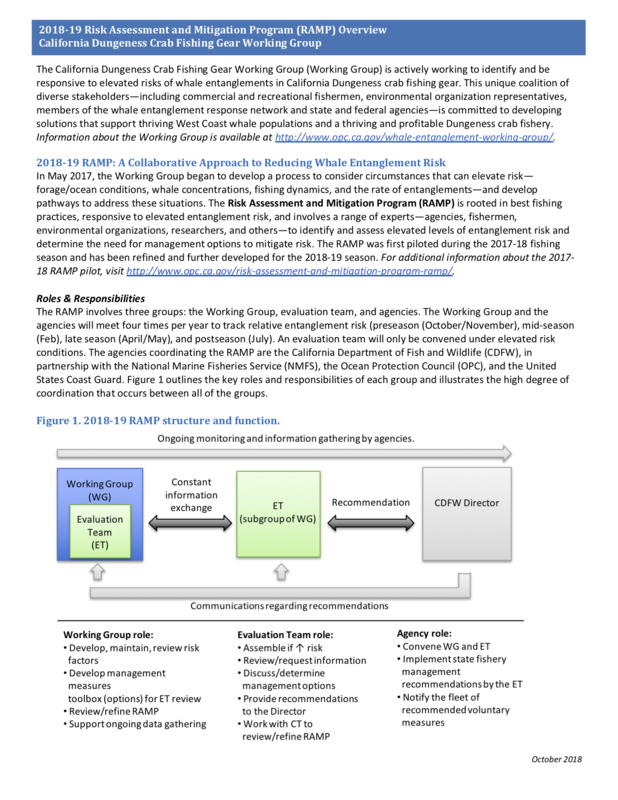 The Working Group welcomes your feedback and insights about the Working Group’s efforts and the 2018-19 RAMP. Please visit http://www.opc.ca.gov/whale-entanglement-working-group or contact the Working Group at info@cawhalegroup.com. The Evaluation Team was convened in response to a report of increased whale activity by members of the whale watch community received on March 15, 2019. Due to optimal weather conditions, on March 15 and 16, 2019 two aerial surveys were coordinated from Pt Lobos north to Gualala (here) where information on whales, forage/prey, and Dungeness crab trap distribution was collected. 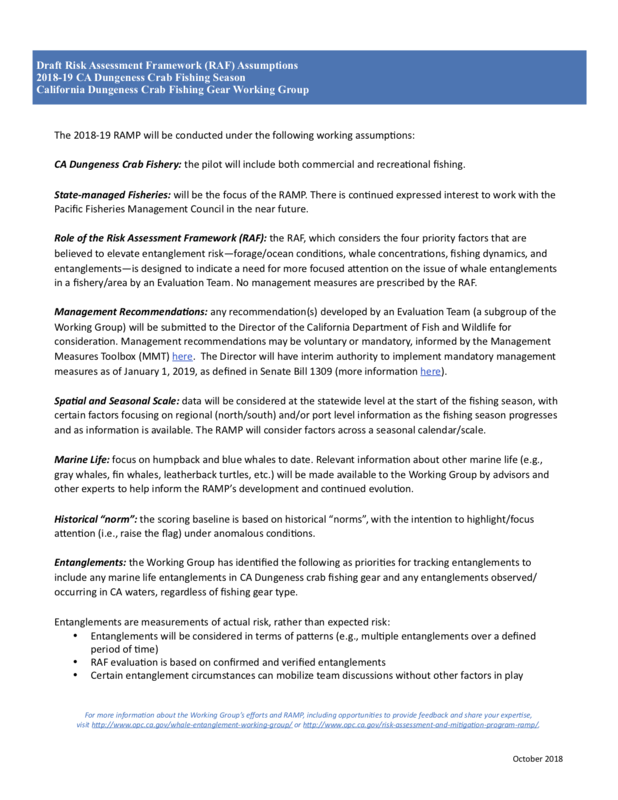 Additional information related to whale concentrations (here), ocean conditions (here), fishing dynamics (via fishermen’s on-the-water observations), and entanglements (here) was also gathered in advance of the March 19 Evaluation Team call. The Evaluation Team determined that humpback whales are beginning to arrive in Dungeness crab fishing grounds. Although humpback and blue whales have not yet arrived in their traditional feeding grounds in moderate or high numbers, humpbacks are expected to arrive in greater numbers the next 2-3 week and blues in April/May. Grey whales are continuing to migrate north and appear to be at minimal risk for entanglement, primarily due to the speed they are traveling (i.e., not remaining in one place for an extended period of time). 1,767 crab traps were observed during the aerial survey in concentrations of up to 12 traps per transect, with fishermen reporting that gear is continually being brought to the dock. The March 14 El Niño Southern Oscillation (ENSO) report indicates a mild El Niño this spring (~80%) and summer (~60%) which has implications for forage and whale distributions. Additionally, based on the aerial survey, fishermen’s observations, and previous forage reports, it is anticipated that this spring we will see strong abundance of both krill and anchovies.